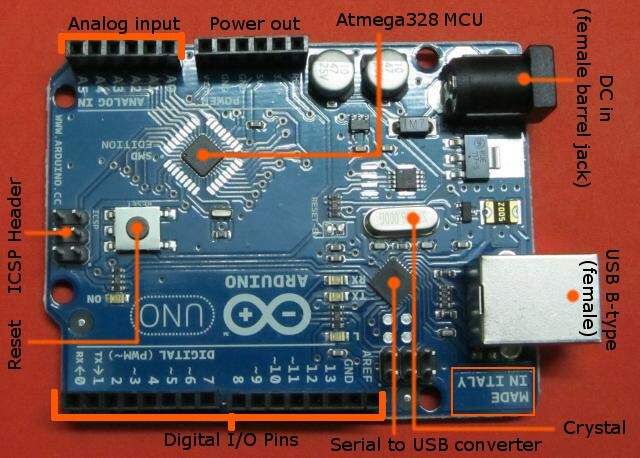 We have developed this article as a beginners guide for Arduino.Â We have compiled many of our arduino articles to help you understand the board better and begin your first serious project using Arduino. So let’s begin. Ever thought of working with microcontrollers, but resisted due to lack of knowledge about them? Ever made a futile attempt of reading a wholeÂ microcontroller datasheet? Can’t afford to buy the costly USB programmers for your microcontrollers? Get ready.! Arduino answers your laments! Well, first let me explain what arduino exactly is. Arduino in general is a opensource platform targetting hobbiysts. Most of us using the interent would have came across the word “opensouce”. Opensource is a methodology where, the developers of a software/hardware give the end user access to their end product’s design and implementation. That means the end user has rights to modify/change the way a software looks/works and redistribute it. Examples of opensource software are Linux operating system, freePCB, openBSD etc [Remember: MS Windows is not an opensource software]. Coming to arduino, arduino is an opensource hardware and software platform which uses Atmel microcontroller as core hardware component and Java as a core software language and which is used to control LEDs, Motors,displays and any hobby projects. The main aim of arduino project is to make everyone try microcontrollers – you don’t even have to care what controller is used. Its that simple! Just plug-it into your computer’s USB port and download the program into the controller board from your computer and the board can be used in the required application. 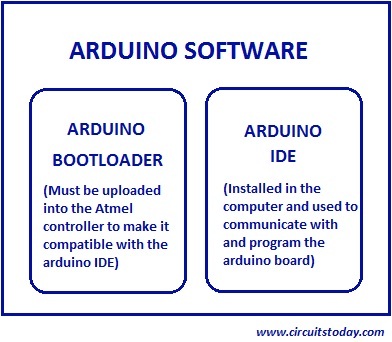 Bootloader is a little piece of code residing inside the microcontrollerÂ which makes the controller special and gives it the power of integration to the arduino IDE and the arduino board. With the bootloader erased, when you try to program from the IDE, the controller won’t understand anything! 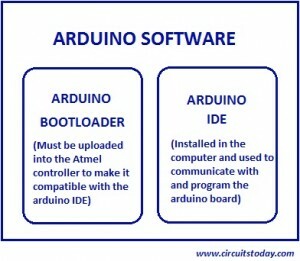 In simple words, the bootloader acts as a translator between the controller and the arduino IDE. You have to load the bootloader in to the controller (from a different programmer)Â before integrating it with the arduino board. The arduino IDE is installed in the computer. The IDE has a compiler, serial monitor etc.Â Arduino language isÂ a variant of c++ – atleast it looks like c++ programs. Program is written, compiled and uploaded from the IDE to the board.The language is really really simple!.Â The IDE has the options to select from different versions of arduino board with different controllers and also has options to select the particular communication port where the arduino board is connected. Shields are mountable things on arduino board which enables easy interfacing of modules such as LCD, ethernet etc., elimating the need for wires. Ther are huge variety of shields for almost all applications. All these projects are developed and tested by our engineering team. You can buy the components and try them with confidence. Nice article….Thank u….It means that we can write code on arduino ? No need to write code in 8051 programming language? Thanks for the details. But I think those are not enough. Could you please provide more details with Arduino circuits. More hobbyist will be benefited. I hav understood your clear Explanations Sir, But would like to make my own local Microcontroller(uC)/ Arduino; can you pls help me on how to do that! Thanks in Anticipation. Urs blogger. You are doing such an awesome job of enlightening the people about these user friendly devices and bringing them into this brilliant field. Keep up the good work. @Whisker: I am afraid its either way pal. The IC acts as serial to USB converter when data flows from the microcontroller to the computer and USB to serial converter when data flows in reverse direction! In the board’s picture, is the USB to serial converter wrongly named as serial-to-USB converter?